A PhD student said she was ejected from an Oxford University gender equality talk - because she brought her toddler. 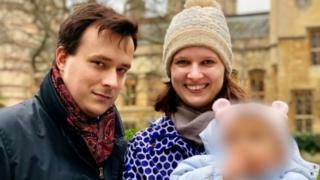 Ania Kordala, 28, said she had been excited at the prospect of hearing former Australian Prime Minister Julia Gillard speak on Tuesday. But she was asked to leave the Women and Leadership talk because her 16-month-old's "babbling" was picked up by a camera at the event, she said. The university said it was a "regrettable miscommunication". Ms Kordala said she had been told children could not be accommodated when she applied for tickets, but decided to speak to staff on the door. When she got to the Sheldonian Theatre, the principal of her college spoke to organisers, who let her in. Once inside with daughter Pola, she found a seat next to a camera filming the event. But, five minutes into the talk, she said a woman approached and said "you need to leave", because the camera was picking up Pola's "babbling". Ms Kordala said she had felt discriminated against, despite the event being aimed at women. "This is the irony, this is the first time I have felt able to use that expression," she said. "The people who need to attend this talk are the people who are in my position, who are parents. "When I didn't have a child it was a lot easier to be more proactive and to try to be a leader than it is now, as my time is limited." "I wanted to hear what Julia Gillard had to say because she had been through a lot when she was prime minister of Australia." An Oxford University spokesman said Ms Kordala was ejected due to a "regrettable miscommunication between the event organisers and the external team filming the event". He added: "Generally, the Sheldonian welcomes children and families at events." Ms Gillard was Australia's first female prime minister, and has spoken about receiving "vile" abuse during her time in office.